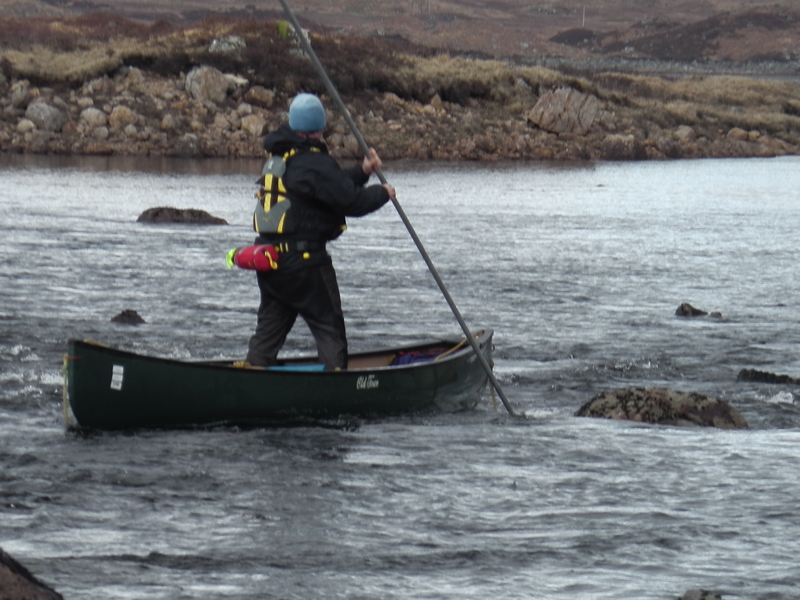 Quite simply an amazing canoe journey! Travelling by canoe, camping along the way and paddling some stunning waterways. If you are up for the challenge then we would love to have you along. Bring a sense of adventure and we will show why Scotland is an amazing canoeing country. 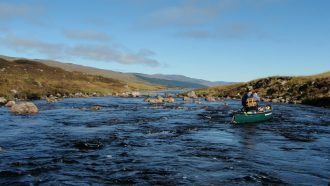 This is a classic Scottish Open Canoe journey, world class. 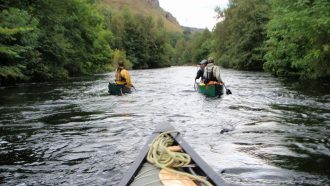 It connects the wet high moor down to one of the country’s biggest rivers – the river Tay. 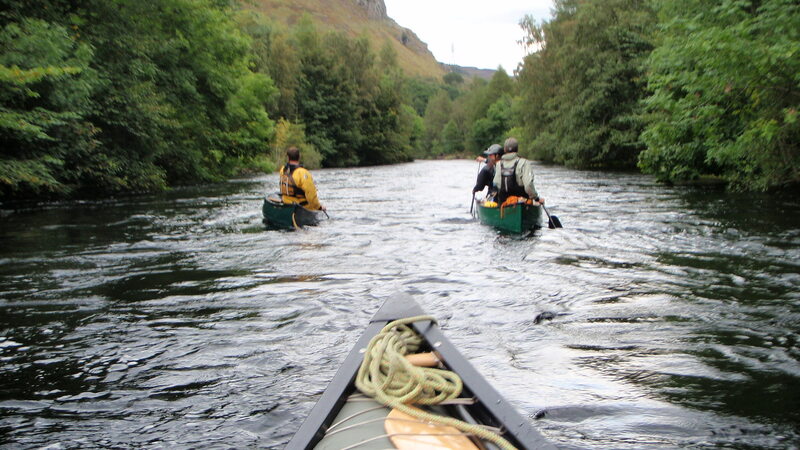 Connecting all of the lochs and rivers along the way we will utilise the full repertoire of canoe skills – river running, sailing, poling, snubbing, paddling and portaging. The decision of what skill to use and when will be at the forefront of the mind when journeying through this wild and remote part of Scotland. Along the way sightings of roe & deer, curlews, grouse, otters and potentially beaver as we move down onto the Tay adds to the magic of crossing Rannoch Moor. Starting from the high point of Loch Ba in the West you follow the water East and then South until you have reached as far as your time allowed or the water becomes salty as you enter the sea. 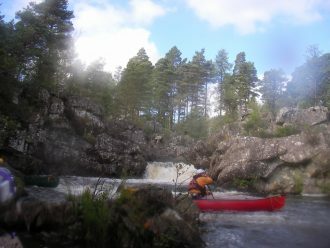 Paddling away from the road (A82) and navigating through the myriad of islands, shallow areas and the rocks give a great sense of excitement. Gradually the loch starts to narrow and the route into the Abhainn Ba begins. This wet boggy area gives you a very tight twisty, shallow, rocky paddle / pole / line / wade with the canoe. The decision of when to change tactic to keep going is always challenging you. This 2.5km river / burn lets you know that you are now on an adventure. Negotiating the river eventually spits you out onto Loch Laidon. This loch is a true highland gem. With stunning views behind you towards the Glencoe hills and mountains as well as the views ahead past Rannoch station on towards Ben Alder you are left breathless! This long (9km) thin loch usually gives the opportunity to sail along and conserve energy for a truly stunning river lies at the end. 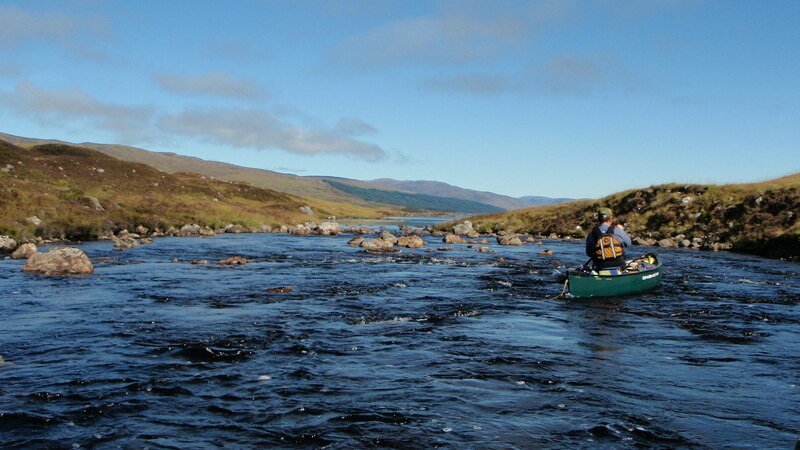 The Grabh Ghaoir is the last of the natural rivers that you get to paddle prior to getting the river Tay. Finding the entrance can sometimes be a challenge but once on the surrounding scenery is awe inspiring. Passing the peat bogs and old tree routes leads to a false sense before the river suddenly picks up pace. This highland river twists and turns and doesn’t let up all the way into Loch Eigheach. Continuous moving water that tests your nerve and skill as you check, set then drive your canoe around the river. 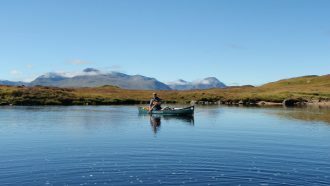 The sense of achievement of controlling your loaded canoe in this highland river stays with you as you look for the great camp site on the side of the loch. Short morning paddle across the loch. Watch out for the kelpie or water horse that legend has it was the fiercest in Scotland. The loch is a deep loch mainly thanks to the hydro-electric works and dam at its eastern end. It’s this dam that is the first portage for the trip. Thankfully there is a track on the southern side to follow. The track will take you down to the weir where you can get back onto the water. 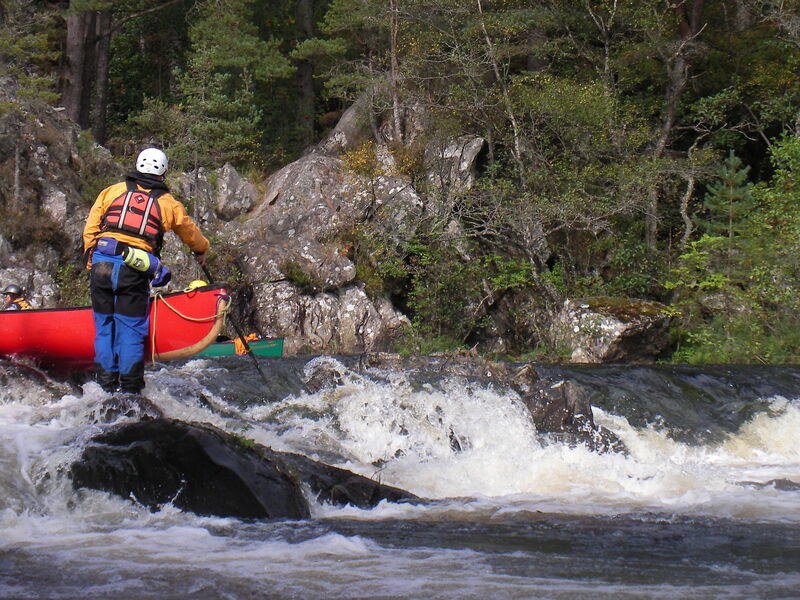 The river Gaur is a wider more powerful river that has a few meaty rapids to navigate. Depending on flow there a few choices – portage, line or run! A couple of them could go up grade 4 so time to read the river well. This river marks the return to some form of civilisation as the road runs along the north bank. 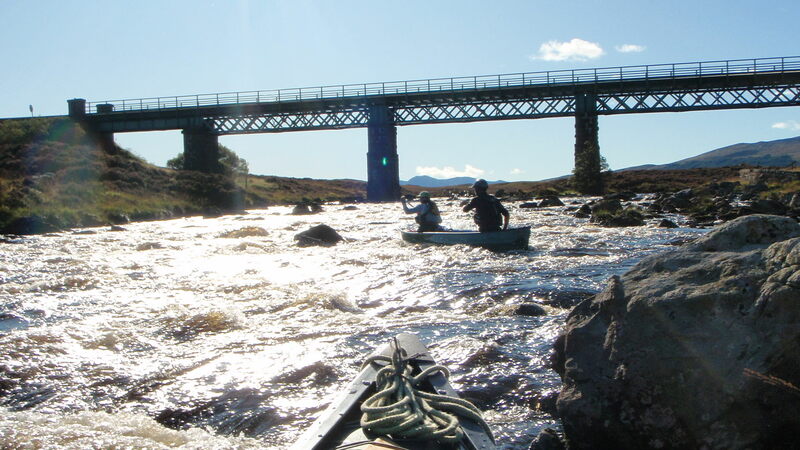 The reward for paddling the river is a stunning paddle through Bridge of Gaur out onto Loch Rannoch. 15km loch – let’s hope there is wind behind us…. Time for head down and get on with it. However, it is a loch steeped in history. Views towards Schiehallion (she-hally-on) – or Fairy hill! Paddle past the site of an old prison and refuge. Eilean nam Faoileag has a tower on it dating back to the 19th Century and references going back as far the 15th Century of people residing on the island. The eastern end of the loch takes you the next dam at Kinloch Rannoch. The temptation is stop here and visit the pub / café but the draw to get onto Dunalistair Reservoir to find your campsite is never far from your mind. Dunalistair Water or Reservoir is a really unique piece of water. It is entirely man-made. It feels like little Canada as you paddle through this piece of water that provides a water source for the Tummel hydro scheme. The dam here was built in the 1930’s and gives an interesting portage round on the north side. This is a big day. The river – Upper Tummel – has some very challenging water on it. Most of the tim e is on a compensation flow so not pushy but enough that gives some exciting and challenging water. Various rapids go at grade 3 with more committing sections. However, all are dealt with by paddling, lining or portaging. Once through a sigh of relief and Loch Tummel appears. T he beautiful 11km loch cuts through an area steeped in history. With 17th century clan estates, cairn circles, old forts and sites made famous by Queen Victoria it leads to a sense of days gone by. You are more concerned that the next dam is fast approaching. Clunie dam – built in the 1950’s it is reputed to have raised the level of the loch by 4.5 metres and gives a portage round onto the next section of the river Tummel. Most will camp at the loch side. A short paddle to the dam and portage round gets the muscles ready for the next river. The river sees quite a bit of paddle sport / rafting activity in the summer months. The famous Linn of Tummel is also here. The river itself has a few grade 3 rapids that need to be navigated. It is a technical river that keeps the canoeist on their toes. Getting to the end of the river and seeing where the river Garry comes in leads you to dream of other routes. The Garry system will not be far from your mind and will lead you to ponder maps on your return. Here you have made a significant milestone on the journey. You have turned south. The short man-made Loch Faskally (3.5km) created in 1950 takes you right down into Pitlochry. This brings a shock to the system as you have entered civilisation as the dam here has a salmon fish ladder where the tourists come to see the thousands of fish ascend on their way to the spawning grounds. Once the portage is completed a short paddle to get out of town and down the next section of the river Tummel to find a camp for your last night. This braided fast section of water gives outstanding views around. Your last day on this particular journey finishes at the little habitation of Ballinluig. 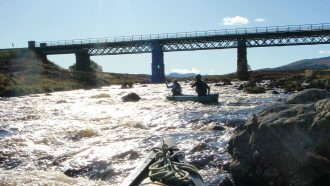 The short paddle from camp brings you to the main bridge over the river (just above the river Tay confluence) and time to pack up and find the local café for a well-earned piece of cake! What a trip! This is right up there as one of the canoe journeys in the UK. It should be at the top of any canoeists to do list and is achievable for any canoeist who has put the time in. Come and test your canoeing and put the full repertoire of skills together in one incredible journey. If you fancy experiencing this journey for yourself, we have a 5 day course departing in August. Click here to learn more. Watch our video of the Crossing to really inspire you!